I Love You More Than Carrots: Life With 3 Is A "Breeze"... Said No Mom Ever. Except Now. Life With 3 Is A "Breeze"... Said No Mom Ever. Except Now. I remember reading somewhere that, when surveyed, the average Mom of Three (MOT) said that her biggest challenge with three kids was that she only had two arms. I read this little tidbit long before I even entertained the thought of having a third baby and it's amazing how quickly after birthing our newest addition that I looked around the OR wondering where a third (and let's face it, fourth) arm might be hiding. Sure, all moms could use an extra hand (or two, or ten). It's one of those Shared Motherly Desires that bonds together those of us in the trenches, specifically when our offspring are acting particularly, what's the word... hellacious. For me, my biggest challenge is often navigating parking lots and crossing streets while simultaneously trying to herd what feels like a pack of feral cats but is really just my 4 year old and 2 year old. It's in those moments that I wish I could tie them both to the baby's stroller and drag them close behind me. Which baby product company offers that stroller attachment? Hello, cash cow! Although our home environment is much less stressful than, say, a parking lot full of cars, I continue to struggle with Having Two Arms And Three Children (HTATC. Look it up, I'm certain it's a syndrome). Can you picture me trying to spread peanut butter on a sandwich, build a garbage truck from only red and yellow Duplo blocks (exasperated sigh, MOM!) while nursing the baby and pry an overzealous two year old down from the kitchen table? If you can, then you just witnessed yesterday's twelve o' clock hour in our home, just one out of the twenty-four hours in the day. You can only imagine what the other hours must look like. As a MOT, when everyone is melting down over various life disappointments, not only is it difficult to think straight over all the screaming but it's difficult to decide in that moment whose needs to meet first. I've quickly learned, in my six weeks as a MOT, that addressing the older twos' needs, the two that can understand, relate and negotiate, is usually the best way to deal with the drama. This often requires putting the baby down, in a safe place, while tending to the Drama of the Hour (DOH). Do you know what else often requires the use of two or more hands? Baby equipment. Whether it's a stroller, high chair or baby pen, most "safe baby spaces" on the market require the use of two hands to operate. That doesn't work for this MOT. I need something I can manipulate with one hand and one hand only and something that doesn't send me into a fit of muttered curse words and screams that would rival the screams and shouts of the DOH. Always use your playard on a flat, even surface. Want in on a little sanity-saving secret? No, it's not wine (today,) it's the 4Moms Breeze. Whether I use it as a bassinet next to our bed or a safe space to place the baby while on the main level of our home, away from poky fingers and inquiring big brothers, it only requires the use of one hand to open and close. It's that easy. After several weeks of using the Breeze, I can say without a doubt that I am a Breeze Believer. Whether we're on the main level of the house, in the yard gardening, getting ready for bed at night or road tripping to Gammie and Poppy's house in New Jersey, the Breeze makes this MOT's life that much easier. From diaper changes to cat naps to "Mommy Just Needs A Minute," the 4Moms Breeze has been a MOT must-have. Just look at this lady- nary a sweat broken nor manicure chipped while setting up the 4Moms Breeze. In fact, I would almost trade the use of a third arm for our 4Moms Breeze, that's how much I love it. And I'm not the only one who loves it. 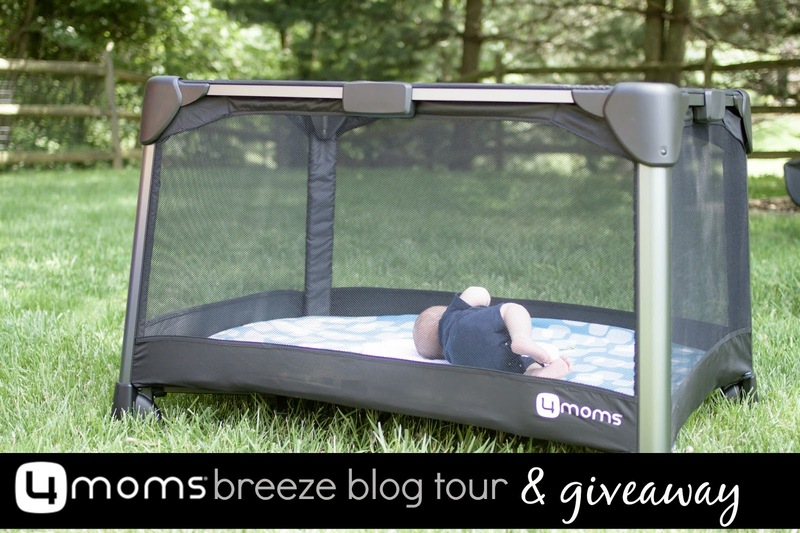 Head on over to the 4Moms Facebook page to read other mothers' testimonials as they share their Breeze Believer stories during the Breeze Blog Tour and offer their readers the chance to win their own Breeze all month long! 4Moms is also running a contest on their Facebook page - A Breeze A Day daily giveaway! The contest has four rounds, each one starting on a Sunday in June. You enter once each round to be eligible for that week's daily drawings. Today and for the next seven days, you can enter right here on I Love You More Than Carrots for your chance to win a 4Moms Breeze! Giveaway is open to residents of both the U.S. and Canada! No purchase necessary to enter. Entry is easy! Use the Rafflecopter widget below. Winner will be contacted via email and announced once confirmed. Good luck to all those who enter! This post is sponsored by my working relationship with the incredible 4Moms brand. All thoughts and opinions exchanged above are honest and my own. I received product free of charge in exchange for said thoughts. No financial compensation was received. I'm a true 4Moms fan and know you will be too! Breeze! We borrowed one for a vacation and my baby slept in it no problem. What a saving grave when in a strange place. I would love to win one of these to make our crazy life a little easier! I love the mamaroo, it has great reviews and seems like a necessary addition to any nursery! I love the Origami stroller and the Breeze. The breeze looks great!! I would love to get the mama roo! Love your photo of babe in the yard. Perfect! This mom of four (I KNOW, right!?) was just about to be all sassy and say: "You know what they'll never make one-hand operational? A stroller! And that's what we really need." Then I went to the website and saw the "Just touch a button" stroller. I'm sitting here all slackjawed. I love the mamaroo! I think it would be very soothing to a newborn! Really hope to get one before our newest little one arrives in August! I would love the chance to win! Thanks! Rockaroo all the way - I've heard SUCH amazing things about them! We had the mamaroo with my first and it was amazing. I think the Origami stroller is out of control- who wouldnt want something so high tech! I think my gadget loving hubby and I would love to own the Origami too bad I'd have to sell my husband to buy it haha! Ugh, you are making me want the whole 4Moms line for this new little one on the way! First time hearing about this brand - thanks for sharing! First time hearing about this brand/products - thanks for sharing! Love your blog & Instagram!! I'm about to enter the MOT zone at the end of July! I would love the breeze just moving into a two story house it would be great for the first floor and it's not an eyesore to leave out. I would also love the mamaroo! The Mamaroo & the Breeze are definitely on my list! The Mamaroo and the Breeze are definitely on my list! I think the mamaroo is pretty cool. Wish I had one for my daughter! The mamaroo looks pretty cool! Mamaroo is my all time fav!!! I was was worried if my little one would like it be he absutely LOVES it! 4moms is such a fantastic mom friendly company!!!!!! I don't have any of their products yet but have been dying for the mamaroo since I had my first baby and now that #2 is on the way that's exactly what I need. The Breeze is currently at the top of my list after fighting with our pack and play every time we move it. Mamaroo - we already bought one for Baby #2 and I cannot wait to use it! I wish I had bought the mamaroo for my second baby, who is now almost 9 months! She would have loved that! The Breeze and Mamaroo are on my list right now just because I've heard SO many amazing things about them. I'm really crossing my fingers though for this one! The Breeze and Mamaroo are already on my registry because SO many people have told me amazing things about them. I'm crossing my fingers though because we will absolutely need this for Addison once she arrives! We have the mamaroo but have been dying for the breeze! All their products looks great. I think the Origami stroller would be fabulous. New Mom of Three here - 4 weeks in and I NEED this!!! Trying to be a MOT-- definitely need that extra hand in 4Moms! The mamaroo will be a must for me and my husband when we have our baby - the car simulation works wonders with my nephew! Love 4moms products!!! With baby #2 just weeks away, I'd love the breeze!!!! I love 4moms products!!! With baby #2 just weeks away, I'd love the breeze!!!! I love the simplicity of the breeze. I have 2 under 2 right now and this would be amazing for me to win! Pregnant with my second one and this looks like just the thing I need with my active 3 year old boy! Pregnant with twins and this would be great!!! First off- I'm only a mother of 1 currently but I want 3 kids so I absolutely adore reading your blog and see myself in your shoes in a few years! We also share a sense of humor- you crack me up! Now onto which 4moms products I'm crushing on- that's a hard one! We love our mamaroo but I would also love the rockaroo, breeze, and I would kill for the origami- talk about simplicity with that thing! I totally want to try the mamaroo or rockaroo! I am looking forward to seeing the new stroller they are advertising! I love this breeze and would love to win one!! I would love this when I have to shuffle my little one around to his grandparents' house! I'm currently pregnant with number 2 and my husband and I were just talking about not having enough hands! I hated the play pen we used for our first, it was so hard to open and close I never moved it! So the breeze would be perfect! I'm pregnant with number two and my husband and I were just talking about how we don't have enough hands! I hated the play pen we had for our first, it was so hard to open and close so I never moved it! The breeze would be perfect! I NEED this! I'm already strategizing about where I'm going to stick this third baby when it arrives to keep it safe from two crazy boys AND 3 years into mothering and owning a pack n' play, I STILL don't know how to set it up and take it down on my own (hard to admit). One step sounds amazing! would love the breeze for my 9 month old! I would love to win this fabulous product!! I totally need this! I hate our pack n' play and would love the breeze! The Breeze would be amazing right now! Perfect for playing outside with the three year old while the baby rests. Love this and so need it for my three week old! This is definitely something we could put to good use in our 3 story townhouse. There aren't enough "safe from a 3 year old" places to put a newborn on each floor! This looks like a life saver! Man, where was this when I had my 4 year old?? 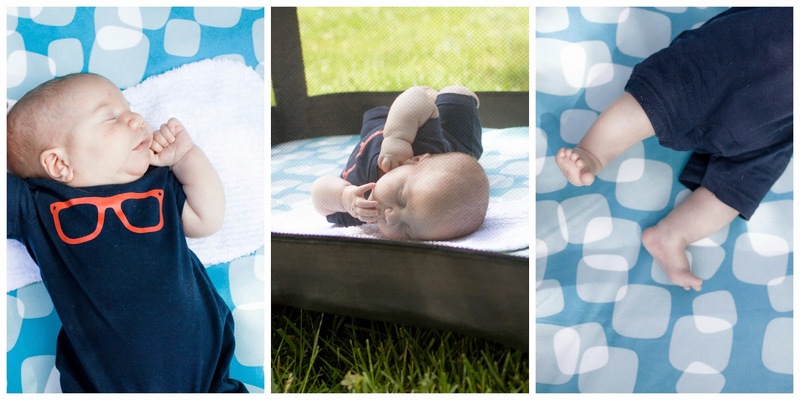 I love that breeze playard but super adore the origami mini that is coming soon. Really wish I would have had this with my 4 year old. I would love this Breeze Playard as we are hoping to add a #3 soon. I adore the mini origami stroller coming out too!! Both of my boys have loved the MamaRoo. The MamaRoo looks amazing! Seems like you wouldn't need any other seat for the baby. I really think the Breeze looks fantastic but I love all 4moms products, the mamaroo looks awesome as well. I can totally relate to this thinking back to when I became a MOT.... now I will need one for sure when I become a MOF (four!!!!) in September!!! I'd love the breeze! It looks so easy and would be a great thing for our beach vacation! I love all of the 4Moms products, haven't had a chance to try any of them out yet though. This would be great. mamaRoo but I think it looks so peaceful and less like a piece of baby plastic! I love everything! The origami stroller is so cool though!! The breeze for me please! Looks like a great option! The breeze or the mamaroo but I really love everything! I think I need the Breeze! I totally need this for baby #2 due this fall. It would be perfect for the baby while chasing after my toddler! One touch stroller and pack play? As a mo, of three myself those sound amazing! We thought the pack ply was broken the first time we tried to set up our graco one. Hours later we had it figured out. I think the Breeze looks like a lifesaver! The Origami stroller. I LOVE ITS Unique style. I might collecting 4moms products for my first baby. The breeze. I have lots of yard work living in the country and need to keep the kids away from snakes. Mamaroo, for sure. My daughter has colic and I am suffering with PPD. It would come in very handy for sure. I love the breeze. Name says it all! saw the origami and thought it was awesome! i really want to try out the breeze! saw the origami and thought it was cool! now would love to try the breeze! I think the 4moms rockaRoo would be my favorite item-- besides the Breeze. The rockaRoo would be FUN but the Breeze is just plain needed. would love to win this...perfect for my little one while we are all outside. The breeze would definitely be my favorite especially since we have weekly dinner nights with friends and being able to just pack up the breeze for our little ones would be so incredibly useful. Our last pack and play was such a disaster that I ended up giving it away because I hated it so much. This momma has learned her lesson, and baby #2 supplies are all about simplifying our life not making it more difficult. The Breeze is the one I love the most! I do think the car seat looks pretty amazing as well! The whole line is pretty amazing but id love the breeze! I could use a new play pen for number three! Breeze or the stroller most definitely! The Breeze! It would make life so much easier ;) I have such trouble setting up the traditional kind! I tried it at MommyCon and it was great! I would love one for my new one coming in October! I got to try the Breeze at MommyCon and it was awesome! Would be great for baby coming in October! I have the mamaRoo but would LOVE to have the Origami! What a tricked out stroller! Actually, I just want one of everything! I have the mamaRoo but would LOVE the Origami. What a tricked out stroller! Actually, I would love to have one of everything from 4moms! I like the info about the breeze being anlble to set up with one hand. I would love to win the breeze! It definitely looks so comfortable and I'm sure my baby boy would love it.! The description of the breeze being easy to set up. I have the mamaRoo and LOVE it! The breeze looks so great! I hate the look of our ugly pack n play! I'd love the Origami stroller. It is amazing! I think the origami is awesome! I've been drooling over 4moms products for months, alas it is out of my price range. Fantastic products! I love this blog - not sure how I haven't found it before now. The breeze deff seems like a winner in the baby gear. Hope I can win one. The breeze looks amazing!! We love our Momaroo... Our life would be out of control without its the only place our baby likes to be outside of our arms...he loves it. I wish I had this! It would make life easier. I love this blog. Not sure how I haven't found it before now. The breeze deff seems like a winner in baby gear. Hope I can win one! The breeze looks amazing!! We love our Mamaroo...it's the only place our baby likes to be outside of in our arms... Our lives would be chaos without it!! Love everything 4Moms!! I would love to try a Mamaroo. I have always wanted to have a breeze since before Ariana arrived thanks for its easy of use AND how STURDY it is. Now that I know her personality she would rock the current "play yard" we have if we slept in it. The MamaRoo - I've seen it in stores and it is amazing. The MamaRoo is honestly my favorite product by 4moms!! I want one of my own so bad for this new baby!!! The MamaRoo - I've seen it in stores and it is amazing! I haven't actually seen one in person but the Origami stroller is my favorite! It looks so sleek and modern, and the perfect size for our limited trunk space with 4 kiddos! My husband had to have the MamaRoo. If the Breeze was available when my baby girl was born, it would have been top of my list. She just turned 1, but it came out after. Not sure how we missed the Origami. But hubby wants #2 soon, so we shall see. Want a breeze so badly! I love the mamaroo, but almost wish my boys waited a few month so I could have tried out the new carseat. I bet it great for tired mamas. Just to double check to make sure everything is right. The macaroni is probably the coolest piece of baby gear ever! I love the mamaroo, but almost wish my boys waited a few months so I could have tried the new carseat. I bet it will be a life saver for new mamas. I love the easiness of the breeze! My hubby had to have the MamaRoo for our baby girl. If the Breeze was around when we were expecting (she just turned 1), it would have been top of list. I hate fooling around with our pack n plays. Not sure how we missed the Origami stroller, but will definitely look at for the future little ones. We love our mamaroo! Would love to have the oragami or the breeze though! The Breeze! It looks so easy to use! I totally need one! It's so hard to work in my garden with a 4 month old... maybe this could give me some hands-free time! I love the Origami stroller b/c it looks so neat and has some really cool features! Also loving this play yard! I love the Mamaroo! It is the coolest baby product I've seen but I need the Breeze seems like a much more practical purchase. I love both products! I have been obsessed with the Breeze since I saw it at MommyCon LA last October. I need this! The breeze! We need one for roadtripping! The mamaroo is amazing for getting those newborns to sleep! The Breeze for sure. With two littles it would come in handy. They make the best products! I would love to try a mamaroo! I love them all but the mama too saved my sanity! I love everything but the mama roo saved my sanity! I love the Mamaroo because it is so compact and pretty. Not a MOT...yet. Expecting my first in August. Maybe one day I'll be a MOT. The Mamaroo, I play ambiental music so this is the best way to share it with the little one, as you can add mp3s to the rockers. I love that feature. The breeze also rocks, for multitasking mommies, it´s like the best thing ever not to entertain yourself and waste time putting together the playard. Love the mamaroo and the breeze. Currently expecting my first but it looks so easy and amazing! love the breeze because it looks so easy! The more I read about this the more O want it! Love the mommaRoo...best swing ever!